As a result of severe tooth decay, the innermost layer of your teeth, known as the pulp, can become infected. When the pulp becomes infected, this will cause pain and inflammation in the nerve endings, blood vessels, and connective tissues the pulp contains. In order to alleviate pain and remove the infected tissue, a root canal becomes necessary. A root canal is an endodontic procedure that removes infected pulp from the inside of your tooth. Although root canals are primarily performed as a result of tooth decay, they may also be needed in instances where your tooth has become injured, cracked, or chipped in such a way that the pulp is affected. The Greek words “endo” meaning inside and “odont” meaning tooth make up the modern word “Endodontic”, and literally means to treat the inside of the tooth. If you are displaying any of these symptoms and believe you may need a root canal, schedule a consultation with Dr. Dalzell of Raleigh Endodontics immediately. What can I expect during my root canal at Raleigh Endodontics? Before your root canal, you will be properly anesthetized to ensure your comfort during the procedure. 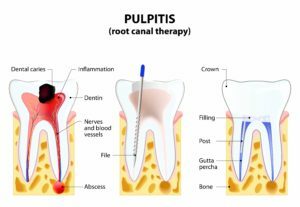 To begin your root canal, a tiny hole will be drilled in the crown of your tooth in order to access the pulp. Once the pulp has been accessed, the infected pulp will be removed from the pulp chamber. Then, the chamber and root canals will be thoroughly cleaned and properly shaped. Finally, the remaining space will be filled with a rubber-like material called gutta percha. Although many people expect root canals to hurt, this is generally not the case. In fact, root canals will actually alleviate the pain you felt prior to the procedure. However, sometimes there may be residual pain after the procedure caused by the effects of the infection. Since the infection has been removed, this pain should fade within a few days when the inflammation decreases. After your root canal, you will want to avoid chewing on the affected side until a permanent restoration has been placed to protect your tooth. 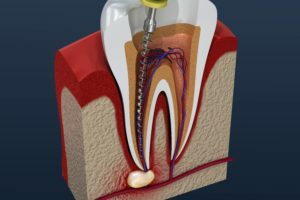 In some cases, the permanent restoration may be placed at the time of the root canal and in other cases, you may be fitted with a temporary restoration. Once the permanent restoration is in place, you will simply need to continue your daily dental routine consisting of twice daily brushing and once daily flossing. Once your tooth has been treated with a root canal, it will have the same lifespan as your other natural teeth. In some cases, root canal re-treatment may be needed if the tooth becomes infected again or if the tooth heals improperly after the root canal. Sometimes root canal re-treatment may also be required if there is new decay, tooth trauma, or if a filling has become loose, cracked, or broken.